The Internet for the first time has beaten newspapers as a preferred destination for news, according to the Pew Research Center for People & the Press. “The Internet, which emerged this year as a leading source for campaign news, has now surpassed all other media except television as a main source for national and international news,” Pew reported yesterday. Forty percent of those responding to a survey conducted earlier this month said they got most of their news from the web, while only 35% cited newspapers. 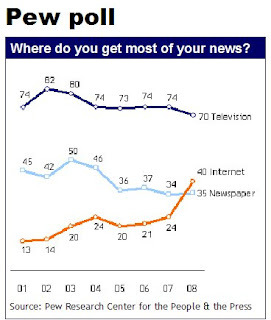 In September, 2007, a similar poll found that 24% favored the Internet and 34% preferred newspapers. The Internet is an even more commanding source of news for young people. Fully 59% of Americans under the age of 30 named the Internet as their favored source of news, while only 28% cited newspapers. Pew’s records show that young people have preferred the Internet over print since at least as far back as August, 2006, when the spread was 32% for the Net vs. 29% for newspapers. The unmistakable trend for the population as a whole is shown in the graph below. Of course, most of the news on the Internet still originates with newspapers. That may or may not be the case for long. John: Mumbai? Denver? Yeah, I think that time has passed. I think that with the demise of the mainstream media, we will only get more and better news. When and if newspapers "go broke", the quality of information available to post on the net will decline dramatically unless alternative sources are developed. To say that newspapers are as biased as news releases by corporations, institutions, political parties and lobby groups is incredibly naive. Granted they do carry news releases mentioned above, but the newspapers of record, i.e. NYT, WSJ, etc., spend money investigating stories - sometimes for months. I don't see how media releases, citizen reporting and interested amateurs will be able to break stories that involve investigative journalism. While it's great that we can have people "on the street" provide basic updates and photos of current events, I still am wondering who will be asking the difficult questions (and spending the money) that true journalism requires. When the organizations behind newspapers go away, who will be the trusted sources who can fill that gap? I hope that true news organizations can find a way to maintain their integrity and finances in a web-dominated environment. For now, I can't quite cheer the rise of "net news." Evil Pundit's first line got it right, that obviously the bulk of news is generated by newspaper journalists. But if anyone thinks that citizen journalism is...well, real journalism, then they ought to run a community newspaper. And is sure as hell isn't the future of anything that anyone will take serious. I own a small newspaper in the Midwest and the readers that (attempt to) report news or make intelligent online comments can rarely do either. And Evil, where are the good bloggers? And they are trained how and where? Hmmmmm...might you be one? Journalism is alive and well and profitable - no worries here. "Portal" would be more accurate than "source." Anonymous, I've seem plenty of real journalism. And it is, with very few exceptions, appallingly bad. Ignorance of the subject matter, bias, distortion, copying of press releases, deliberate omission of relevant facts, condescension, arrogance -- it's all there. Real journalism is an evil, and it is no longer a necessary one. As for good blogs, you're commenting on one right now. There are many others, but I'm not going to list them for you. You know, I would cheerfully pay for a decent "community newspaper." Unfortunately, the 3 or so available in my area are far below 'decent'. The 'journalists' involved are just a hair above illiterate, sloppy, and have pretty much zero knowledge of what they report on. Additionally, the 'news' content (let alone 'investigative news') approaches zero, too. We agreed on that and also that each of us could record the entire interview. Of course, I was given no such access and what was published was wrong, nowhere to be found in the audio tapes, and given a spin that totally changed my POV. Gosh, why wouldn't people prefer this level of professionalism to bloggers? There is much whining about what happens when the major newspapers go belly up, thanks to the Internet. How the Internet takes its cues from the newspapers. But the newspapers are about control of information managed by journalists and editors. Such people were always hostile to the aspirations of the poor and powerless in any case. The true story was often more accurately told by gossip than by the news media. So now the newspapers have lost their audience and their power and control to set the tone of news. Good. They will not be missed, at least not by some. I think the survey has more to do with online vs printed content rather than newspaper created vs blog/citizen created content. Newspapers need to figure out how to monetize the web ASAP, and at the end of the day, that's their main challenge. A lot of people are still reading newspaper content, it's just on the web now which doesn't generate revenue. It irritates me when people forget that. I've worked as a newspaper journalist for the past 10 years. Yes, newspapers have to do more to take advantage of the web, yes they risk getting their asses handed to them by smaller start-up, web based news organizations (not citizen blogers, but hard charging trained journalists using web distribution). However, the current problem facing newspapers isn't the fault of journalists! It's an advertising/ business model breakdown. The quality of newspaper journalism is suffering now, no question. But it's because newsrooms are being cut to the bone, killing resources and morale at the same time. For anyone who has never worked in a newsroom: good journalism is VERY hard to produce. Frankly, it can be hard to come by, for both journalists and news consumers alike. It takes a number of talented people working together with a little bit of time and money thrown in. If you don't have talented people, you don't have good journalism, period. If you think a shiny, new model of quality journalism is just going to burst full-grown out of Zues's head after newspapers collapse, then good luck with that. I'm not saying newspapers won't collapse, just don't hold your breath that something better will take its place. It's way easier to tear down a system than to build a new one. Newspapers and other MSM 'manage news' they don't necessarily report what is happening. They had become too political and all very lopsided to the left. You cannot survive serving only half of the population. Especially if that is the half that is young and less likely to either read a paper or even be able to read a paper. This is a natural transition to a new and better media. It is in the tradition of losers losing and winners winning. Soon, there will be web news sites that will be able to afford to collect the news at site and input from that site for accuracy. The high cost of Newspapers and TN going out to get the story cost far too much because of the decadent demands of the star reporters, anchor men and the standard of living travel and entertainment required ... let's also mention the incredible salaries paid. The new web media will be more guerrilla and innovative. Michael Yon has been riding point on this trend for a long time. It will probably take about 20 years before this new media becomes and corrupt and decadent as the MSM is now. That is the way of the world. do you take your laptop into the bathroom to have something to read while you are on the toilet? Evil said - "As for good blogs, you're commenting on one right now. There are many others, but I'm not going to list them for you." you cant list them because 99.9% of them just regurgitate and throw in their own opinions on the writings of real journalists who, for the most part, work at newspapers. The only reason for decline in quality journalism is the obsessive inclination to cut rather than to invest in the product. When you lose years of institutional knowledge by letting experienced reporters go, the product is going to suffer, whether it's in print or on the web.... and you think a citizen journalists or some guy blogging out of his garage at home is going to fill that void?...get real. Real journalism is largely worthless now, and quite possibly always has been. Journalists are typically ignorant of their subject matter, as most readers learn when they find a story about something of which they have personal knowledge. Here's just one egregious example of real journalism. A room full of professional war correspondents, and not one of them knows what a bullet looks like! Journalists are nothing but opinion writers. They choose their "facts" and "quotes" to suit the point they want to make. Now that blogs are ubiquitous, we readers can get far more choice and far better quality of opinion on the net. I'd trust some guy blogging in his garage over a report by a professional journalist any day. Since most TV stations just rip material from the newspaper and turn it into a video segment, sounds like people are still getting most of their material from print folks via TV - I noticed in the Pew report most people are still getting their news from television. Don't forget as well that the technology enables news outlets to be more efficient. I would pose the question: do we need so many reporters? We have sophisticated enough technology to sift through data to identify trends; we have enough technology for newsrooms to sift through citizen journalism contributions and identify what's newsworthy and what's not. I suspect that "old" style reporters don't want to learn the new technology, new techniques, or at least, their management isn't willing to invest in having them learn. What I suspect will happen, as has happened for thousands of years, is that there will be information haves (the people who know how to access quality information and take the time to seek it out) and the information have nots. The question for our society as mass media declines is who will fill the information inequity gap? And perhaps that's not the role of the reporters and news outlets (though I think it could be)...but of schools, community centers, churches, librarians. I think the burden is on these folks to teach people how to be savvy manipulators of information niches.